For only $99.99, parents can purchase a tablet device designed for kids. 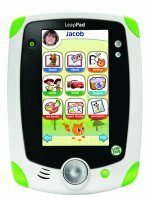 Featuring a 5-inch touch-sensitive screen encased in a durable frame, Leapfrog's version of a kiddie tablet plays Leapfrog downloadable apps, games, ebooks, flashcards and videos. The device also supports games that come in cartridges, and is compatible with those playable on last year's Leapster Explorer handheld gaming system. The LeapPad houses a camera and video recorder, and has a microphone that supports voice commands and recordings. While it comes loaded with lots of apps to explore, the best thing about this system is that it plays the new LeapPad Ultra eBooks, robust interactive books that feature cinematics, learning games, the defining and highlighting of words as read and the adjustment of reading level based on the child's ability. Parents will welcome the connection to the Leapfrog Learning Path, a service that tracks what kids are learning and then offers suggestions about new apps and games to play next. This is our favorite kiddie tablet.